Pioneer Concrete Pumping Company, Inc. Comment: Build a @20 ft long retaining (type) wall out of blocks and finish with colored stucco. This is a divider wall. Comment: I would like to get an estimate for an installation of a walkway. Please give me a call as soon as possible. Comment: Would like concrete patio area re-coated. Some minor repair work will be needed. Comment: We currently have a DG pathway that runs in our backyard that has little sitting areas along it. We also have a firepit that has pavers under it. I'd like to do pavers on the entire path but wonder the cost? I'm sick of bender board - that keeps coming apart, and weeds that are coming thru on the DG. I want something I can sweep off. Need ideas and pricing! Comment: Both corners of my driveway are broken off due to soil erosion underneath. Carmichael Concrete Contractors are rated 4.77 out of 5 based on 937 reviews of 36 pros. 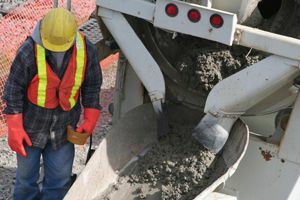 Not Looking for Concrete Contractors in Carmichael, CA?